Third year students of the Medical Doctor Program of the Faculty of Medical Sciences at UWM received their White Coats from the hands of their mentors, symbolizing a new stage in their education. The tradition of the White Coat Ceremony exists in most US and European Medical Universities. The celebration is symbolic for students and lectures, promotes humanistic values in medicine, and also launches a new phase in student education-changing the theory into practice. This year’s ceremony was started by Dean Professor Doctor Andrzej Rynkiewicz MD, PhD. The masters of ceremony were appointed Vice Dean of Student and Faculty Affairs Professor Doctor Elżbieta Jarocka-Cyrta MD, PhD and Vice Dean for English Division Students’ and Development Affairs Doctor Rakesh Jalali MD, PhD. 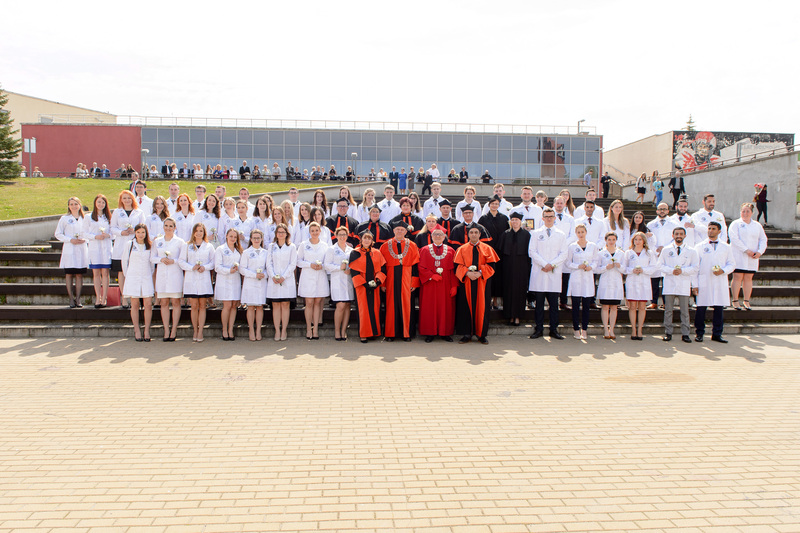 The ceremony was celebrated by the Vice Rector for Medical School Tasks Professor Doctor Wojciech Maksymowicz MD, PhD. Occasional Lecture “Can we do more for out patients?” Professor Doctor Dariusz Zadrożny MD, PhD. We sincerely thank you for attending the ceremony and wish you further success!